The conclusions of that greenhouse study and others like it are very poor when applied to actual outdoor conditions (you have to consider other things such as increased evapotranspiration). The paper did seem to address that (details unclear since only the abstract was available), and I already found the 50% reduction outdoor vs indoor paper, so we probably googled pretty much the same thing. I understand there is varying mileage here, but it makes a long fight over a 1% area change seem insignificant in the bigger picture. aren't there stars in front of the moon??? Nooo, are you kidding me? They're all at the same distance, stuck up there on that sky carpet. 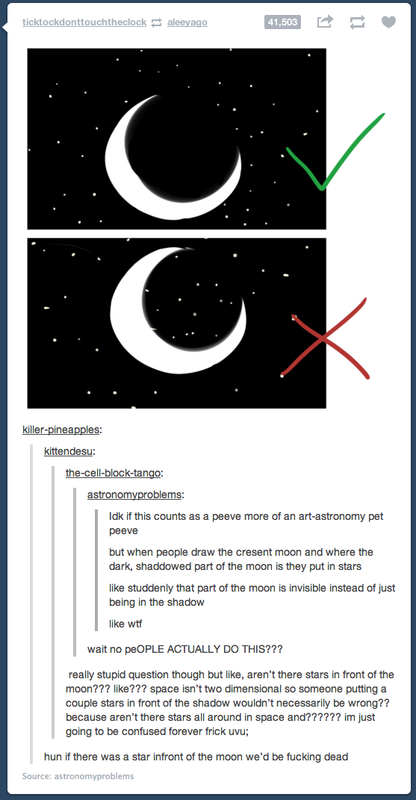 Technically, there can be several star-like sources of light in front of the moon, although they can not be stars. Best scene in the whole move! I'm planning on seeing the new _ _ _ _ _ _ _ _ movie tonight. Obviously. Gosh, some people, you know? If you haven't seen the new Star Trek yet, wait until its on Netflix or DVD. Unfortunately, the only highlight was Alice Eve. And the writer had to apologize for her "gratuitous" scene that defiled women around the world. Hmm, every one I know said the movie was amazing. Not me. I thought it was terrible. Even worse than the first Abrams Trek movie, and I didn't think that was possible. Thank god, at least there's one sane person in the world. Yay! Here's my review of the movie...but be warned, it's ranty. It deeply concerns me that J.J. is at the helm of Star Wars VII. My only consolation in that regard is that enough great stuff has already come out of the Star Wars universe for me to be content with forever (and in fact there's probably more than I'll ever get around to in the first place). Huge earthquake rolling in from the Sea of Okhotsk right now. Huge quakes in this area are relatively common. My geophones were shook pretty hard by the P wave and the seismometer readings went off the chart. Certainly M8, but less than the 2011 Japan quake. Quite possible that it may have set of a tsunami big enough to do damage. EDIT: Magnitude estimates vary from 8.2 to 8.7, so this might be the most powerful known earthquake in this area, despite that it's a very active area. It was probably deep, no tsunami. Worldwide, on average only one earthquake a year can be expected of this magnitude.